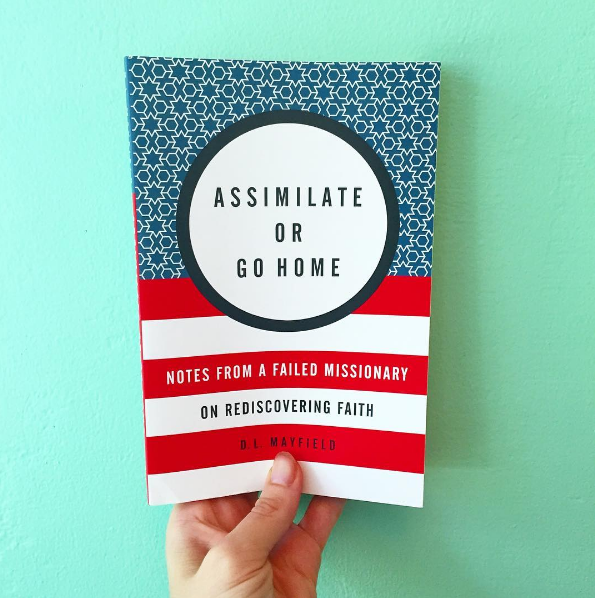 I finally got to read Assimilate or Go Home: Notes from a Failed Missionary on Rediscovering Faith when it released last week and friends, let me tell you it was everything I'd hope it would be. 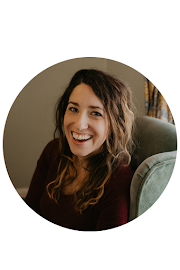 I shamelessly Instagram-hounded her to do a little interview for my blog so that you guys could see for yourselves what a wealth of understanding God has graced her with. 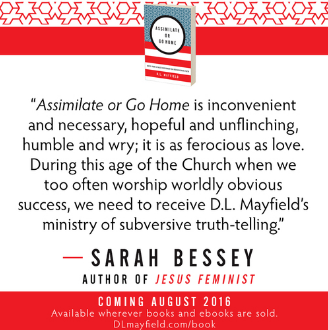 I know you will be challenged and encouraged by her words today, and I do hope they will nudge you into checking out her book. Join me in welcoming D.L. Mayfield! Early on in the book you introduce us to a Somali Bantu refugee woman named Jamila, whom you are meeting with weekly for English lessons. You would supply worksheets with pictures of a sun, for instance, and practice using the word "sunny" but she could never remember it week to week and seemed largely uninterested. It wasn't until years later that you understood that, coming from a pre-literate culture, she had no grid for connecting a circle with lines to the giant bright thing in the sky. As you said, she simply hadn't been raised to think that way. Without being aware, you had put her in a position of weakness and ignorance over and over again. And yet Jamila continued to welcome you into her home week after week, bearing her own undeserved humiliation to extend relationship to you. This took my breath away. Later on you say that we, "the do-gooders", leave before we have the chance to see how poor in relationships we really are. What did your experience with Jamila teach you about your own relational poverty? Jamila and her family (and community, really) opened my eyes to how entrenched I was in communities that were largely homogenous. 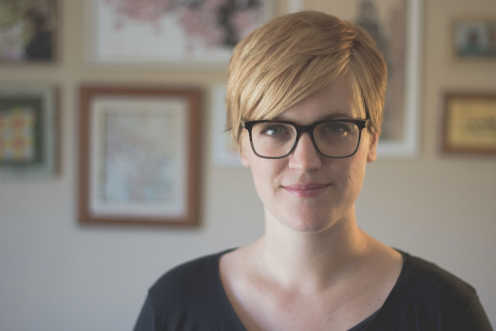 Through my work with the refugee families I learned how little I knew of Muslims, or people from a different socio-economic backgrounds, or people from non-Western perspectives. Since I never knew anyone different from me, I assumed so much about the world. By having my life entangled with one set of people on the margins in America I met others--people experiencing generational poverty--and I realized how my reality was not the reality of so many. By broadening my scope of who was in my circle, I broadened my perspective of who I let teach me. And I learned more about God, myself, and my country than I possibly wanted. You talk a lot about food in your book, and there is so much symbolism there: cultural identity, spiritual hunger, relational hunger, a common humanity, poverty. Food is an integral part of any culture and I imagine only more so when a community of displaced persons is trying to hold on to their identity. What have you learned about food in these past 10 years and how has it informed your relationships? I have been all over the map (literally and figuratively) with mission work in my life and have done more than my fair share of short-term trips or projects. Only in the last four years have I been educated on the ways those can actually be more harmful than helpful, and I look back on some of the things I've done and truly grimace. (i.e. work in a Kenyan orphanage for a month, begin to build attachments, and then leave behind orphans with yet one more reason to believe that relationships aren't forever) In the book, you mention that you and your husband eventually stopped inviting people to come volunteer in the refugee community. Can you tell us more about that decision? This is still something I struggle with, honestly. There is a great need for people to be working against inequality and injustice in the lives of people on the margins of America, but this can only happen through the life-changing work of long-term relational engagement. It still seems like the dominant western Christian model of engagement is centered around short term work: going in, doing an event or a project, feeling awesome, and then leaving. To me it is pretty clear that this is centered around the experience of the giver, and is very hierarchical. In our quest for real relationships we have discovered that it takes time and intentionality and nothing else can substitute for that. So while we no longer invite tons of people to come and pop in and meet some refugees, we do have certain felt needs that are great ways for people to get engaged--things like tutoring at English classes or helping out at homework clubs. For me, this is a win-win. 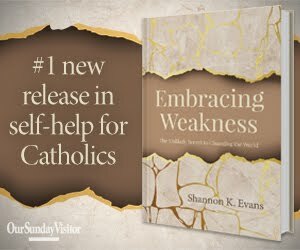 People really need help in these practical ways and it also creates bridges for Christians and other folks to meet and be changed by relationship. Can you tell us why there is no word or phrase for "thank you" in the Somali language? To us Americans that expression feels very important and I imagine most of us assumed that every language had something comparable. Well in the book I write about how there is a phrase for "thank you" in Somali culture, but it is not used every day like we Americans are used to. I was in a cultural class and I asked my teacher (a young Somali man) about it and he explained that to him, every single person was valuable and worthy of helping. So if someone asked for a cup of cold water, you would just give it to them--they don't need to say thank you, because everyone deserves water when they are thirsty. For me, this blew my mind in two ways: one, I thought it was a beautiful picture of the inherent dignity of humankind--how we are all made in the image of God and deserve to be treated as such. And two, it revealed to me my own longing for people to say thank you when I "helped" them, and how contingent my love was on getting recognition as a do-gooder. That was a pretty devastating realization. When you and your husband first moved into the low income apartment complex to be closer to the Somali Bantu people, you had idealistic dreams of how precious it would be. Eric and I had the very same mental images when we moved into an Indonesian kampung in 2009 and I laughed out loud when you said it took so much energy that at night you would lock your doors and watch TV, because YES, THAT. I think we watched every released Harry Potter movie a dozen times each. How long did it take to turn a corner, or have you? What advice would you give someone who has fresh dreams of living in solidarity with the poor one day? The ministry of Harry Potter is REAL. But yeah, I still believe that self-care is important, and I still have seasons of having to survive my life--but my real goal is not for my apartment or home to be my sanctuary but for it to just be another part of my life. Sometimes I don't have any control over this. For instance, I am an introvert who is the primary care-giver for two little kids, so just that alone makes me want to curl up in a corner in the evenings and not talk to anyone. Add into that living with and interacting with neighbors from all over the world (many of whom come from very communal cultures) and that just gets a bit heightened. I think at this point in my life I am ok with saying that we all have different needs (due to personality and cultural upbringing) and I think having rhythms and routines both of rest and of celebration can be very helpful for getting out of the survival mindset. The only conclusion you come to in the book is that God loves us. It is so terribly wonderful, so mysteriously simple. How has this new understanding of the heart of God changed the way you see your role in His plan for the world? I still struggle with it. I still have so many days of feeling despondent over how bad things are in the world, or how problematic I am, or how we all could be doing so much more. But in the end, as I lost all faith in myself being able to convert anyone, I gained so much more faith in God, the power of the Bible, and the ability of the Holy Spirit to speak to us all. It's very freeing, actually. When I do believe in this wild love, it takes all the pressure off of me. All I have to do is be obedient to that next step God is asking me to take. Many, many thanks to D.L. Mayfield for taking the time to do this interview. 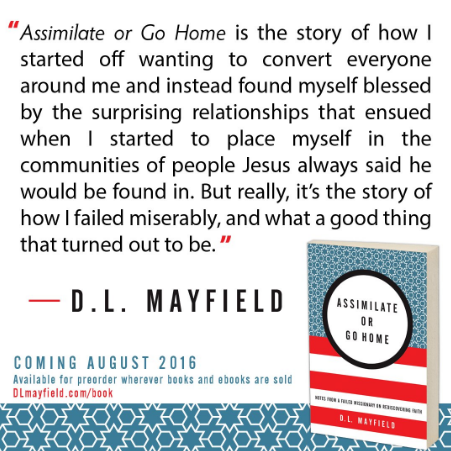 Assimilate or Go Home: Notes from a Failed Missionary on Rediscovering Faith is less than $10 on Amazon right now, so do your heart and mind both a giant favor and check it out.